What happens when a computer savvy well-seasoned guitar player teams up with a producer who is a two-time Grammy Award winner?Releasing his third album, Jim Allchin collaborated with Tom Hambridge to compile an artistic series of zeros and ones that will light up any PC or cell. 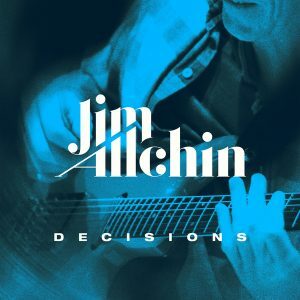 Jim’s new release, titled Decisions, as Jim explains “is a study in the decisions we make in our life about identify, relationships,” and how to live life authentically.” In other words, Decisions is a kickass blues album. Decisions opens the first track with a hand-clapping piece, “Artificial Life.” I love the way the piece intros the first thirty-five seconds with guitar and organ climbing upward. With Allchin’s uncommon guitar, track three, “Bad Decisions,” is spot-on. One stanza, “Even when I’m winning, I’m losing in the end,” stands out with me. With Hambridge on drums, the video is awesome. “Blew Me Away” is a well done Texas Blues piece, but I think “Step in a Big Pile of Blues” fits as an alternate title. Providing variety to the album, Jim breaks away from traditional blues with a love ballad, “She Is It.” A Boogie-woogie piece, “Just Plain Sick,” got my attention. It’s an excellent instrumental that sounds as if the musicians were jamming when someone realized they had something cool to record. “You Might Be Wrong” is my favorite. It has a smooth keyboard with a Delta guitar in the background, possibly a Dobro. Jim Allchin is not your average musician. He demonstrates that his successful resume does not disqualify him from singing the blues. Recovering from cancer and melanoma, he has channeled his unique experiences into his music, making Decisions special. It also doesn’t hurt having Tom Hambridge as your producer, with a long list of outstanding musicians. As Jim stated, “Love what you do, and appreciate every second.” Jim’s Decisions, makes it count. I’m J.R. Miller with High Note Reviews, and this is Jim Allchin making Decisions.